Bertolli has launched a redesigned bottle across Thailand and Malaysia from September 2018. Below is the press release on the Thai launch. For the first time in brand’s history, Bertolli, Thailand’s and the world’s number one olive oil brand, celebrates its new redesigned bottle launching across Thailand from September. Transforming its previous traditional bottle into a modern oval-shape, created for easy-ergonomics, modern aesthetics and timeless design, to be an asset in any modern Thai kitchen. Since the 1950s, when olive oil was packaged in metal cans and drums, it was Bertolli who became a packaging pioneer using glass bottle as the container to better protect olive oil. The idea was so popular that now the global standard packaging is glass. The new oval bottle was designed to pay homage to its Italian heritage in Lucca, Tuscany reflecting the town’s unique architecture, shaped to replicate Lucca’s famous oval-shaped center. In 2018, smart packaging trend is predicted to grow and Bertolli is going in that direction as well for our new design bottle is not only product container. 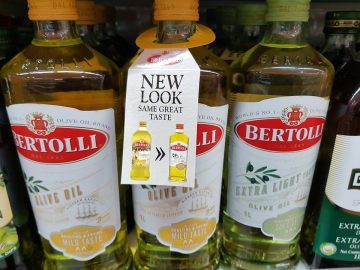 Bertolli was the first company to identify on the label the important health benefits of olive oil for consumers, and in 2018, the redesigned bottle can represent the brand’s heritage to Thais, bringing Italian premium taste to Southeast Asia.